We live in an age when every precious and vital truth concerning the Lord Jesus is attacked and questioned, the deity of the Lord Jesus being no exception. Past and present, there is a rebellious component of the human heart that denies the very essence of who the Lord Jesus is. In simple terms, the deity of the Lord Jesus is the truth that He is God, nothing less, ever. The Lord Jesus in the New Testament is one and the same as Jehovah in the Old Testament. This fact is unacceptable to the unbeliever. From the first-century self-serving Pharisees to the fourth-century “Arians” to modern cults, and perhaps even to your friends, the Lord Jesus falls short of being God. Thankfully, Scripture leaves no doubt, with a thorough presentation of this truth. Scripture confirms that the Lord Jesus is, at every point, fully God. The young believer will discover that this essential doctrine, easily gleaned from the Scripture, is a solid foundation for our daily Christian walk. 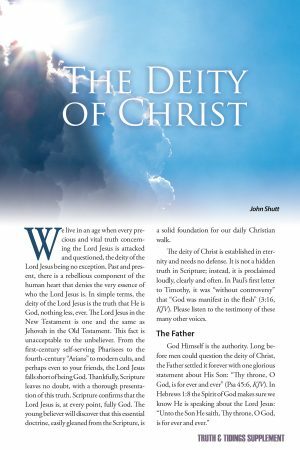 The deity of Christ is established in eternity and needs no defense. It is not a hidden truth in Scripture; instead, it is proclaimed loudly, clearly and often. In Paul’s first letter to Timothy, it was “without controversy” that “God was manifest in the flesh” (3:16, KJV). Please listen to the testimony of these many other voices. The Lord Jesus shocked the Jews with this claim: “Before Abraham was, I am” (John 8:58, KJV). I have no doubt that they, knowing the Old Testament thoroughly, thought of Moses at Horeb when God told him to tell the people that “I AM has sent me unto you” (Exo 3:14, KJV). Their arguments were futile and their anger manifest as they understood that this was a direct claim to be God, the eternal “I AM.” Later, in the temple, the Lord again answered the Jews’ questioning with the bold statement that “I and my Father are one” (John 10:30, KJV). For the second time, their wicked hands picked up stones to hurl at Him. Finally, it was the Lord who questioned them: “What think ye of Christ? Whose son is he?” (Matt 22:42, KJV). He then silenced them with a quotation from Psalm 110:1 to show that He was indeed God: “The Lord said unto my Lord, Sit thou at my right hand, until I make thine enemies thy footstool” (KJV). We may be far removed in time, culture, and language; however, the Jews present when the Lord spoke were very sure of His claims. In their own words, the Lord “said also that God was His Father, making Himself equal with God” (John 5:18, KJV. See also 10:33, 19:7). In great grace, the Lord said to the paralytic, “Son, your sins are forgiven.” The response of the Jews was “Who can forgive sins but God only?” (Mark 2:5, 7). Well said! If only they thought more about their own words. In Luke 2:11, the angel had a wonderful message for the shepherds: “For unto you is born this day in the city of David a Savior, which is Christ the Lord” (KJV). The consistent use of “Lord” in chapter 2 (vv11, 22-23) presents Christ as Jehovah as drawn from Exodus 13. Take the time to read Revelation 5 on your own and determine whether or not the angels in the throne room worshipped the Lord Jesus as God or as someone less. John was given a special task, and he was unabashedly faithful in it. He declared that the Lord Jesus was before him in preference and time, and answered the questioning Jews by quoting Isaiah 40:3: “The voice of one crying in the wilderness, Prepare ye the way of the Lord, make His paths straight” (Matt 3:3, KJV). The One coming was the Lord (Jehovah)! “In the beginning was the Word, and the Word was with God, and the Word was God” (John 1:1, KJV). These simple yet profound words from John’s Gospel were perhaps some of the first verses we memorized as children. The apostle John spoke with clarity and comfort when teaching about the Son who came, “the Truth” who perfectly revealed the Father. John said, “we are in Him that is true, even in His Son Jesus Christ. This is the true God, and eternal life” (1John 5:20, KJV). There was no doubt in his mind. It is wonderful to think that John, who was so intimate with the perfect humanity of the Lord, could also declare His perfect deity. After the resurrection, when Thomas was finally in the presence of the Lord Jesus, there was only one possible response from his heart: “My Lord and my God” (John 20:28, KJV). Yes, “doubting” Thomas may have been less than perfect, but it is hard to criticize someone who comes to the point of such profound understanding. The person of Christ filled the heart of the apostle Paul, and he longed for fellow Israelites, that they, too, would appreciate “Christ, who is God over all, blessed forever. Amen” (Rom 9:5, ESV). To the Philippians, he extolled the humility of One “Who, being in the form of God, thought it not robbery to be equal with God” (2:6, KJV). Truly, we are complete in Christ: “For in him dwells all the fulness of the Godhead bodily” (Col 2:9, Darby). In addition to what we already noted from Psalm 45, the Spirit of God declares in Hebrews 1 that the Lord Jesus is the out-shining or “radiance of the glory of God and the exact imprint of His nature” (v3, ESV). How could anyone less than God fully reveal God? In verse 10, a continuation of the address to the Son, God cites the Creator in Psalm 102 and calls Him Lord (Jehovah). Many years before the birth of Christ, the prophet Isaiah revealed the details: “Behold, a virgin shall conceive, and bear a son, and shall call His name Immanuel” (Isa 7:14, KJV). Matthew adds the interpretation “God with us” (Matt 1:23). Again, Isaiah provides invaluable truth informing us that the child born of Mary was no less than “The mighty God” (Isa 9:6). What amazing humility; the wonder is not in His deity, but in His humanity! God claims to be the “first and the last” three times in Isaiah (41:4, 44:6, 48:12). It is no coincidence that the Lord Jesus claims to be the “first and the last” three times in the book of Revelation (1:17, 2:8, 22:13). Many additional Scriptures point to the deity of the One who is “Christ the power of God, and the wisdom of God” (1Cor 1:24, KJV). Many are the deeds traced through the Gospels which speak to the omnipotence, omniscience, omnipresence, eternality, and sovereignty of the Lord Jesus. It is good to remember, however, that if the Lord Jesus had never performed a single miracle, He would still have been fully God. His recorded actions serve as confirmation of what was already true. There is a wonderful “oneness” in the relationship between the Father and the Son. They are one in essence (John 10:30), one in honor (John 5:23), one in possessions (John 16:15), one in dominion (Rev 22:1), one in salvation (Isa 43:11), and one in glory (Isa 42:8, Rev 21:23, Heb 1:3). I am sure there are many more points of equality that can be found. Reading the Scriptures with appreciation for the deity of Christ will open to your view an endless goldmine of truth. The doctrine of the Trinity will be clarified, as well as statements like “God said, Let us…” (Gen 1:26). Think of the wise men who worshiped the child in Bethlehem, and remember that the Scripture sanctions the worship of God only, no exceptions (Rev 19:10). The Lord had a 100% success rate in performing miracles, including raising the dead, and He alone could read the thoughts of others. This all points to His deity. Does this doctrine really matter? Of course, my level of appreciation will not change what is an eternal truth; however, it will change me. Let me suggest a few reasons to cultivate a greater appreciation for the deity of Christ. First, correct doctrine will prevent confusion and the corruption of related truth. Understanding who Christ is lays the foundation for every other truth that He taught; it is a preservative. Second, if our humility is modeled after that of the Lord Jesus, it is astounding to think that God Himself became the lowest of men to save me. So much for my pride. Likewise, His love to me is drawn from the unplumbed depths of His eternal essence; it cannot be greater. In addition, my eternal security is based on the full divine perfection of the One who was my substitute at Calvary. I can rest knowing that there could not have been a greater sacrifice. Finally (the list is endless), the deity of my Savior demands a reverence and obedience that is reserved for God alone. May God grant us the clarity, humility, love, assurance and godly fear that result from sound doctrine. So, the Lord’s question is still relevant, “But who do you say that I am?” (Matt 16:15, ESV). Clarity on this point was important to the Lord Jesus. Is it important to you? Does it affect my daily life? Even the youngest believer has declared the deity of the Lord Jesus at the moment of salvation: “For whosoever shall call upon the name of the Lord shall be saved” (Rom 10:13, KJV). Paul presents Christ as the Lord Jehovah when he quotes this from Joel 2:32. For those who are baptized, you have already declared the equality of the Godhead by being baptized “in the name of the Father, and of the Son, and of the Holy Ghost” (Matt 28:19). Your simple act of obedience teaches truth that the wisdom of this world cannot comprehend. Dear believer, fix in your mind the scene of the final return of our Lord. Heaven will burst open as all dignity, all authority, and all sovereignty will be displayed in one glorious Man. How thankful we are that when the Lord Jesus is revealed as “KING OF KINGS, AND LORD OF LORDS” (Rev 19:16, KJV), His deity will never be questioned again!